This still life table is the perfect for product photography. 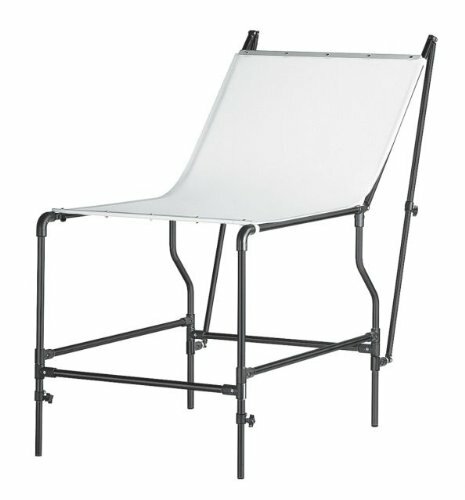 Featuring a translucent cover, this can be lit from the front or back. The black painted frame helps cut down on reflection and glare. Size of panel: 150 x 78cm. Distance from floor to flat surface: 70cm. Height with back in vertical position: 157cm. Adjustable tilting back and adjustable front legs. Color: black; distance from floor to flat surface: 27.56 in. ; height: 61.81 in. ; load capacity: 22.05 lbs. ; material: Perspex; panel size: 150x78cm. ; weight: 31.75 lbs. Black finish to cut down on reflection. Can be lit from either front or back.